Vimbox Movers believe it’s the final touches that make your new house a home for you and your loved ones. If your move has worn you out but you still have those little, frustrating odd jobs, why not request for one of our handymen to complete those final touches. We are more than happy to provide top handyman services and our expert, professionally trained handyman can assist you with most of those odd little jobs around your new home. Our aim is to ensure your house looks and feels like your new home. We are known to provide the best price for quality service. Find comparable quotes for us to match. We are proud to have more than 80% referral rates from satisfied customers that used our services. How Does Our Services Work? With Vimbox Handyman at your service, you no longer have to worry about uneven TV Brackets. 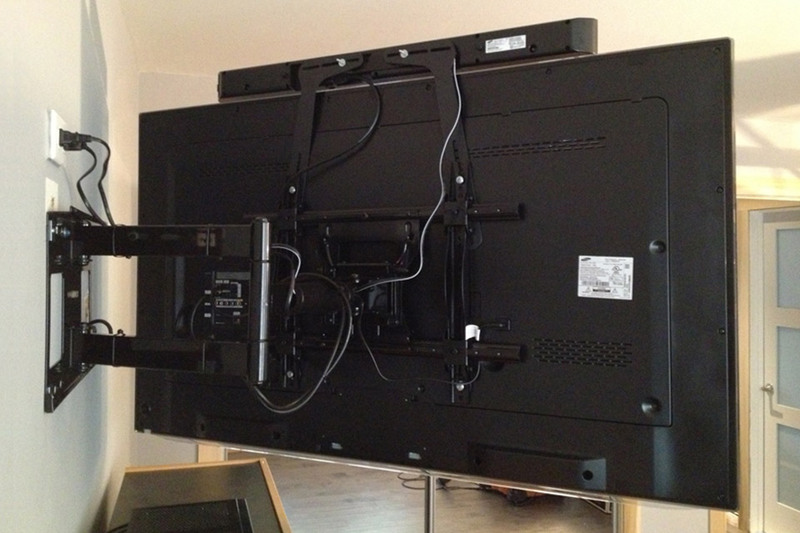 We will also patch up the holes left behind by removing a TV Bracket so that it looks as good as new. Our specialists are equipped with both the knowledge and technical skills to ensure that all complex items are dismantled safely and assembled to its original condition. We assure you the best and most costs effective solution. We also provide other home improvement services. 1Can you help me with drilling and mounting of my pictures & TV? Vimbox professional handyman will be assigned to cater to all your drilling needs. In additional, we do also provide wall hole's patching if required for a small fees! 2Would you be able to help with wiring works? Yes. We do also provide electrical services. 3Do you provide any wall painting or lock changing services? Before or after move painting has been one of our unique selling services, we do also provide lock's changing services due to wear and tear! Vimbox is committed to helping its clients reach their goal of an ideal home. We do so by personalising their experiences, from providing expert advise to the actual work itself. Our handyman team is equipped with the right tools, knowledge and experience to ensure your vision of an ideal home becomes a reality. Our aim is to make your new house a home for you and your loved ones. Our team of handymen will be allocated to you with the right tools and with the best understanding of how to ensure that what you envision for your new home, is achievable without any hassle. On top of that, we give you our word that if you feel that any work is unsatisfactory within 2 weeks, we will send our team to you again to remedy the situation. A home should be your place of retreat, and Vimbox can help you make that happen. Jonathan was very responsive and patient in providing quote, answering questions and coordinating the move. Mover team came early, and in a big team compared with usual movers. High efficient and easy to work with! So pleased with the move- will definitely use Vimbox again. Very happy to have engaged Vimbox. They are very experienced and reliable, and their rates are reasonable. During the move, they were not only fast but careful in wrapping the big and small items. Very professional indeed. Highly recommended. We hired Vimbox to facilitate our move within Singapore, and we have not regretted it. The team handled the move in a timely and very professional way, even having to move the inventory up using stairs to the 3rd and 4th floor. Thanks guys! - Job well done, and I would definitively hire you again! We engaged Vimbox Movers for our recent house relocation after having considered others. The initial impression provided by their sales, Jonathan were favourable and prompt which led us to our decision to engage their service.On the day of the actual relocation, the team arrived punctually and were most helpful throughout the shift. Additional work were willingly rendered by the team from Vimbox when we asked.In all, we are pleased with the professionalism displayed by Vimbox Movers. It’s my second time using Vim box moving service. Luckily, i’ve met the same manager who arranged the schedule my moving 2years ago. I just applied moving services not packing. The price wise, it’s reasonable. Movers were super fast and kind as usual, so i thought i selected the right company among the moving service in Singapore. :)Movers looked quite experienced and professional. I could finish the moving just in 90mins. No doubt i will choose the Vim box my next moving. I engaged the services of Vimbox for my move on 14 April, 2018. My family is very pleased with the dedication, hard work and experience of their staff. Special thanks to - Jonathan (sales consultant) who lent his muscles to good use - Sebastian and Tianfu who were very obliging. When we had additional requirements on the move day, Vimbox management agreed to our request. We are very grateful to the staff who forgo their dinner and finished the assignment only after 9 pm. We will definitely consider Vimbox for our next move. The Vimbox team has been most professional in our relocation recently. Close follow up from Jonathan and Sebastian since site visit till moving day. Team was careful and meticulous with our items during day of move. Great team there! I engaged Vimbox for a residential move involving standard household items. The service was very efficient. More importantly, care was taken by the movers when packing and moving items between the properties. The price was quite affordable and reflected good value. I highly recommend Vimbox to others seeking such services. Timothy and his 3 colleagues did a very good job in our recent move. We had about 150 boxes besides the usual furniture & appliances. They took care to protect all our items and ensure that the fittings & fixtures in our newly renovated apartment were not scratched or damaged. They also helped us sent a few pieces of our old furniture to 2 other locations on the same day. Overall, they made our day less stressful. Well done and thank you to Timothy and his gang. Was checking online for movers & came across Vimbox, couldn't believed the rating for their reviews. Chat on their website and the office staff Ben was swift to arrange for their sales to see my things. the quote was prompt and reasonable, though not the cheapest. I Chose Vimbox nonetheless and everything turn out great and easy, everything is finish under 4 hours. 20 years of my life just seems just like an hour, thank you vimbox and hope you will continue to provide such great service to all. Our move could not have gone more smoothly. The guys were friendly and super hard working and got the job done on time. No stress at all on moving day. Nothing was broken or lost - could not ask for more. Would highly recommend Vimbox! This is my first time using Vimbox. The entire move took less than 2 hours to finish which is much faster than my previous movers. The crew is friendly and efficient. All items arrive at my new place in good shape. Thanks to their special “hanger” trolley, we didn’t have to pack any of our hanging clothes! Payment was per quotation, no extra charge. Special thanks to the consultant, Sebastian who patiently explained the whole process to me. Knowing that I have a few items to dispose, he shared good tips on how to get the best value from them and it works. Great job, Vimbox. Jonathan and his team at vimbox is really fast and efficient. During the move, the team work together really well and each of them know exactly what they need to do. They handle the wrapping of my furniture with care and efficiently. Jonathan has also been very helpful and responsive during the quotation till the moving date. Will definitely use them again if I require any shifting services and will refer to my friends if they also require shifting services. First time moving house to house hence I know the amount of packing all the barang I have accumulated is gonna be challenging. Jonathan was my consultant from Vimbox. He was friendly, informative and thorough. He got back to me with a quotation quite prompt too. A week after the initial meeting, I told him that there will be a change in the amount of things we are bringing over. He was like,“No problem !” And arranged to came down again. On d day, the team sent over were very efficient and professional. They were careful with the furniture and took care with all the packed boxes. They all moved in a very organised and fast pace too. My house with towering mountains of boxes was emptied within hours! Over at the new place, they were very helpful in trying to place all the boxes, furniture in the correct places. Did not regret hiring them at all. Thanks Vimbox! Just moved house with Vimbox. These guys are professional in their work, friendly and helpful. A shout out to Jonathan for addressing our queries promptly and checking to make sure everything is okay. I highly recommend them to anyone who need moving services! Engaged them to shift to two locations. Really impressed by their service and attitude. Truly grateful to Kim, the person in charge for making the move a worry free experience. My only trusted Mover, they deserve a 6 Stars! Movers and packers service from Vimbox agency was awesome. We booked them 1 week in advance and all the required due diligence was done on time.On the day of movement staff arrived on time.. Very cheerful , efficient and co-operative staff.. Good synchronization between the staff.Even they helped us to move our fish tank as well.I would not hesitate to recommend this agency to my friends and relatives.Lastly i would like to take this opportunity to thank Mr.Jonathan for the efficient end to end movement..
Jonathan and his team very helpful, timely, professional, fast and efficient. Really appreciate the Low rate too. They arrived on time and had a pretty large truck. Everything was moved with utmost caution and also left at its correct place. Glad we chose Vim Box. Good experience overall. Excellent job guys!!! I googled for movers to move my house and came across Vimbox Movers. Quote was competitive compared to others and reviews were good too so I decided to go with Vimbox.From site survey to final move, all went so smooth. Jonathan and Esther followed up so closely till final move. All the team came to move is so cheerful and made the move so easy and no stress event. Thank you Vimbox. Jonathan provided a good experience, and prompt service from his team. They were able to move all of my furniture within the stipulated timing, and they were also able to quickly refurnish my new home, and helped to re-set up equipments that needed to be dismantled for the move. An overall great experience, will not hesitate to recommend him to others who want a quality and competitively priced house moving service. These guys were amazing. Bernice was super helpful on the phone and helped set up the appointment and coordinated everything. The supervisor and team on location were so efficient and professional. I highly recommend their services. Great experience with the team from Vimbox. Our first point of contact was Jonathan and we found him very responsive and professional. The moving crew was punctual, careful with our vintage furniture, and incredibly polite. It was clear that they worked well together, communicated clearly and were thus efficient on the day of the move. We were very thankful for how smooth the entire process was from start to finish. A thumbs up for Jonathan and his team. First time using mover company and had lots of question. Jonathan answers all my queries with lots of patience. Movers were punctual and they are very efficient. Everything was moved with utmost caution and they also assist in placing them at its correct place. The guys were friendly and polite. Glad we chose Vim Box. Good experience overall. Excellent job guys!! This is my third shifting with vimbox movers, Jonathan has always been my to-go-to guy for any of our relocation work. Since 3 years back, he has always been very responsive to reply to all of my question. Day & night, give this guy a pat on his shoulder. Vimbox rate is unfortunately not the cheapest you could find, but with the standard and reliability. It should be one of the best few movers in Singapore with an affordable and market rates. Good job boys from the operation side, always extremely polite & helpful! Excellent work, very impressed. From requesting quote , to site consultant. Jonathan has been very helpful throughout! Mover are very helpful & polite. office is great as they will call you to remind you of the move and to seek more feedback after the move. Impressive overall. Excellent mover! They made the process very easy and simple from the booking to the actual day itself. The team that came down is very friendly and efficient. Leaving the entire moving to them with no worries. Highly recommend Vimbox Movers! Jonathan was our contact, he was very professional and responsive. The movers were great, professional and cautious of our belongings. The overall experience with Vimbox Movers was excellent. We would defiantly used them again in the future. I have used Vimbox on two separate occasions now. Fantastic job from both admin (Bernice) and movers. Timely, friendly and efficient. They answered all my questions to ensure a smooth process end to end. I would definitely use again. Quick response and accurate (&competitive) quotation. Came the moving day, we were helped by courteous workers and everything went smoothly. Will definitely recommend to others. Highly recommend Vimbox Movers! Ben was our contact, he was very professional and responsive. The movers were great, professional and cautious of our belongings. The overall experience with Vimbox Movers was excellent. We would definitely used them again in the future. Vimbox Handyman Services are catered specifically for you to make your new house look and feel like a home for you and your loved ones. With our professional team of handyman, those frustrating little odd jobs can completed in a matter of hours. Our Promise to you: Vimbox Handyman makes your house feel like a home.